When Algeria announced a couple of months ago that presidential elections would be held on 18 April, no one could have guessed that the country’s politics would morph into something akin to a Monty Python script. President Abdelaziz Bouteflika’s decision to seek a fifth mandate has sparked weeks of protests across the country - a human wave of a scale not seen since the country’s 1962 declaration of independence from France. Ordinary people are now centre stage, after having been pushed aside by the military nearly six decades ago since the struggle for independence from France (or Algerian revolution) ended in 1962. The chants and slogans of the past two weeks make it clear that Algerians want the revolution - the fight against France, which resulted in Algeria’s independence - to get back on track. 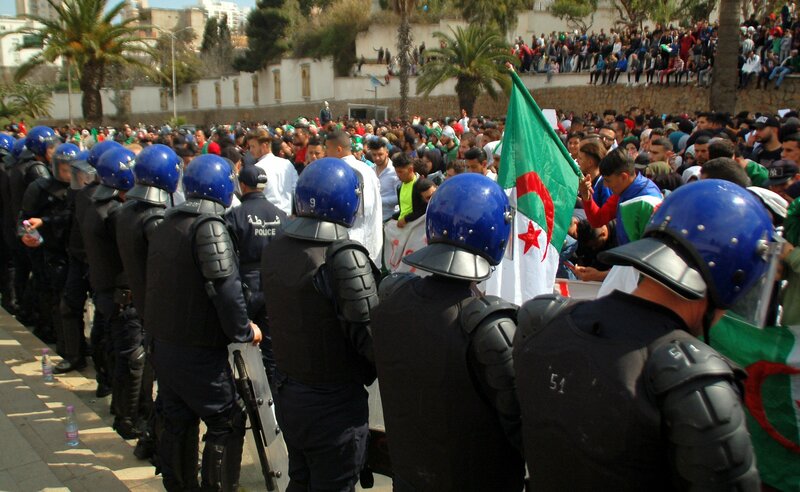 Demonstrators learned one lesson from the ill-fated elections of 1992, after the Algerian military staged a coup d'état to prevent the Islamic Salvation Front (FIS) from winning the second round of what would have been the country's first democratic elections, and the civil war that followed. They also learnt a lesson from the counter-revolution and repression that derailed the Arab Spring (with the exception of Tunisia): do not challenge police and security forces, but rather humour them. The slogans and chants of the past two weeks have been politically savvy, witty, and at times laced with surrealism. No violence has occurred. The crowds include men and women of all classes, regions and ages. The bitter Islamist/anti-Islamist divide that led to civil war has vanished: Algerians want less corruption, more rule of law and freedom, and more jobs. The absolute scandal of Algeria - which is rich in oil, gas and educated young people - is that a quarter of people under 30 are unemployed. Contrary to what some western "experts" clamour from one seminar to another, radical Islamism is not the spectre haunting the Maghreb. Too many Europeans and Western pundits are fighting yesterday’s war. The possibility of harsh repression cannot be ruled out, but the fact that demonstrators have shown restraint and respect for police suggests something deeper may be afoot. Many army officers have no desire to repress, let alone intervene in politics, yet they deeply resent that their country has been turned into an object of ridicule. Another possible scenario is that an interim president could take office for several months or a year, until fair elections could be held. Who could fill this role? Although most young people likely don’t know his name - as he has been banned from state-run television screens for nearly a quarter of a century - Mouloud Hamrouche might fit the bill. Hamrouche, 75, a former colonel in Algeria’s National Liberation Army, led a reformist government from 1989 to 1991 - the likes of which has never been seen in the country. Not a whiff of corruption blemishes his name. I met Hamrouche in 1974 at the table of Ambassador Lakhdar Brahimi and have seen him regularly ever since. Self-deprecating humour is Hamrouche’s trademark, one he shares with many demonstrators. Unlike many Algerian leaders - not to mention Moroccan and Tunisian leaders - he does not have a residence in France, nor any ill-begotten money. No one can predict what will happen in Algiers; the script was not written in advance. Some leading actors will eventually emerge, but today the cast is one of millions. How far the coterie which talks and acts in Bouteflika's name has been damaged, broken may be, the next few weeks will tell. Said and Abderrahim, Bouteflika's brothers, the vainglorious head of the employers federation, Ali Haddad, two former prime ministers, Ahmed Ouhiaya and Abdelmalek Sellal, not to mention the chief of staff, General Ahmed Gaid Salah who was appointed by Bouteflika over the head of more senior and worthy colleagues, appear to have lost the script. France and its European neighbours might be worried about the prospect of a destabilised Algeria, but it is important to remember that France, the EU and the US don’t have much of a say in the outcome - and the stability Algeria has seen since Bouteflika’s 1999 election could not last forever. Western capitals may prefer dictators to chaos, but the latter does not necessarily describe Algeria’s future. What has changed since the early 1990s and the past failure of reforms is that the fault lines have shifted, and younger Algerians are far more mature. Change must come, and it is better if it comes sooner rather than later. A quick glance at the map is enough to understand that a more modern, less corrupt, Algeria led by a new generation will have a huge effect on its neighbours. Algeria has a 1300km Mediterranean borders with Tunisia, Libya, Niger, Mali, Mauritania and Morocco, some of which face severe problems of political stability and terrorism. The largest country in Africa is the linchpin of greater security in the north west of the continent and in the Western Mediterranean.